Stretching the pastry this thin takes some practice, but who’s to complain when you can eat the results? 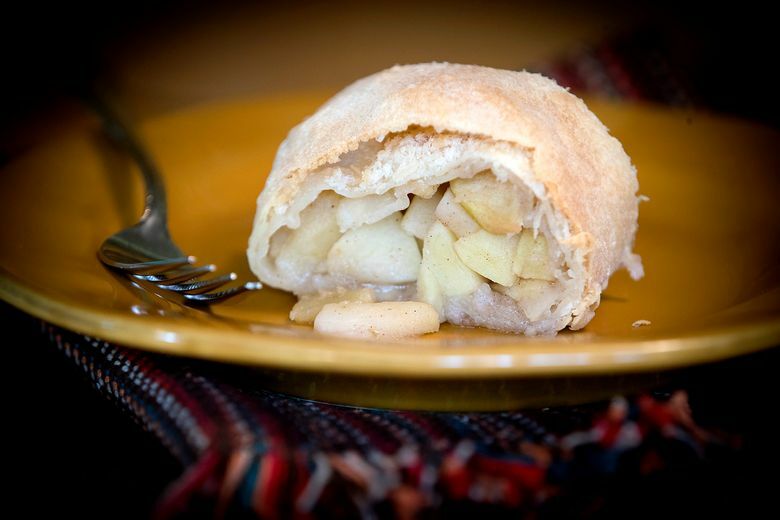 Apple strudel is a trifecta of desserts: It’s fun to say (“struuuu-dle”), fun to eat and — trust us — fun to make. Going out on a bit of a limb here, but strudel is almost easier than making apple pie. And no, we’re not using frozen phyllo pastry, which actually can be a bit of a headache because it dries so quickly and shatters when sliced. Homemade strudel dough is a tender marvel of kitchen chemistry, an extraordinarily extendible sheet of flour, water, oil and vinegar. Granted, recipes vary, defended by centuries of tradition. Some use an egg, which others find a travesty. Some use butter; others favor oil. Some rely on vinegar to help the dough stretch without springing back. Bread flour gets the thumbs-up in many recipes because its higher gluten content makes the dough more elastic. That’s the science. The real fun is in the theater. Strudel dough is gently pulled with your bare hands — ditch the jewelry — slowly, but steadily into a thin, translucent sheet. Best directions ever? It should be so thin you can read a love letter (or even a newspaper headline) through it. Until you work with this dough, you might not believe it’s possible to pull anything this thin. Sure, it can tear, but you can patch it together. And when the strudel is rolled up, such transgressions disappear. The knack is in working gently, but confidently, which may take a few tries. Because the dough is so thin, it will begin to grow brittle if the process takes too long. Once filled with apples and rolled, it must quickly be placed in the oven before the dough gets soggy. Oh, and here’s a timesaving tip: Instead of making and toasting homemade breadcrumbs (to absorb any apple juices), use panko breadcrumbs, which are dry and have lots of texture. Flaky strudels welcome many fillings: Roast a mélange of your garden’s last vegetables and add some feta cheese for a savory pastry. Other options include a mix of cottage and ricotta cheeses, or sour cherries, or pears. Use your imagination (or Google). As noted, strudel-stretching skills improve with experience. But even “not-quite-rights” are perfectly edible. And then you get to try again. Note: Combine a couple of apple varieties for the best flavor. And plan ahead. The dough needs time to rest. 1. In a medium bowl, stir together 2 ½ cups bread flour and salt. 2. In a 2-cup measure, combine the beaten egg, 3 tablespoons oil and vinegar, then add enough water to make 1 cup. Add to flour and mix until the dough comes together in a mass. It should be soft, but not sticky — just tacky enough to clean the sides of the bowl when stirred. If too sticky, add a bit more flour. 3. Scrape dough onto a lightly floured surface and knead several times to make a smooth ball. Then start slapping it against the counter. This helps develop the gluten, which will help it stretch. Slap the dough 70 to 100 times. It should feel smooth and supple. 4. Lightly coat 2 small plates with remaining 1 teaspoon oil. Shape dough into 2 smooth balls and place each on a plate, turning so that all sides are oiled. Cover tightly with plastic wrap. Let rest for 1 hour in a warm place. 5. In the meantime, make filling (see recipe). Prepare the strudel-stretching surface. 6. Cover a flat surface at least 2- by 3-feet square with a clean cloth large enough to hang over the sides. Ideally, you should be able to walk around the cloth on at least 3 sides, such as at a kitchen island. Sprinkle ½ cup all-purpose flour over the cloth, gently rubbing it into the fabric. 7. Move oven rack to the middle and preheat to 400 degrees. Cut 2 pieces of parchment paper to fit a rimmed sheet pan. 8. Important: Remove any rings, watches or bracelets and roll up your sleeves to bare your forearms. 9. Place 1 ball of dough on the floured cloth and roll it into a rectangle about 12 by 18 inches. Melt 3 tablespoons butter and brush about 1 tablespoon of it over the dough; this will help it stretch. 10. Placing your hands under the center of the dough, palms down, slowly begin pulling the dough outward. Work gently, but confidently. The dough is amazingly pliable. You also can use your fingertips to lift and pull, especially as you move toward the edges. Let gravity help you. Move around the dough, maintaining the rectangle shape, until it’s about 18 inches wide and 24 to 28 inches long. If the dough tears, pinch it back together. 11. The dough should be as even as possible in its thinness, and thin enough to read through. Really. 12. With a scissor, trim the “lip” of dough along the edge. Discard. 13. Rewarm the 2 tablespoons butter and, with a pastry brush, scatter half of it over the dough (it’s too delicate to brush). Combine breadcrumbs with 1 tablespoon sugar and stir to mix thoroughly. Then sprinkle ½ cup of the mixture over the surface. 14. From the bowl of Apple Filling, remove 3 cups with a slotted spoon, then arrange in a strip along one end of the dough, 6 inches in from the edge and 1 inch in from the sides. 15. Using the cloth, lift the end of the dough over the apples to cover, then continue lifting the cloth to roll the strudel. About halfway down, pause to fold in the sides, then continue rolling to the end. Roll the strudel onto 1 of the parchment paper sheets, then lift the parchment onto the baking sheet. Brush strudel with remaining 1 tablespoon butter, rewarming if necessary. 16. Immediately place strudel in oven and bake for 20 minutes. Reduce to 350 degrees and bake 20 minutes more. Transfer to a wire rack. Reset oven temperature to 400 degrees. 17. After you’ve reduced the oven temperature for the first strudel, begin rolling and stretching the remaining ball of dough, repeating the process and using the second sheet of parchment to transfer it to the baking sheet. 18. This second strudel also may be frozen for later use by rolling it onto a length of plastic wrap and wrapping tightly. Carefully roll onto a baking sheet and freeze solid, then wrap in aluminum foil. Use within 2 months, unwrapping and baking from frozen at 375 degrees for 40 to 50 minutes. Combine apples, 2/3 cup sugar, cinnamon, raisins (if using), lemon juice and salt in a large bowl.